Lately I have fallen down when it comes to the number of MacroTourist posts. It’s not that I didn’t want to write, but I got Lennon’ed with life getting in the way of my plans. So to remedy this situation, I have decided to commit to posting today’s write up, but also a follow up tomorrow. I figure that if I promise you two pieces, the shame of not following through will ensure compliance. Call it my own little life hack. It’s normal for the stock market to ignore a rising interest-rate trend for a long time. The reason is that while the interest rate is a major determinant of the value of most corporations, the interest rate that matters for equity valuation isn’t the current one. 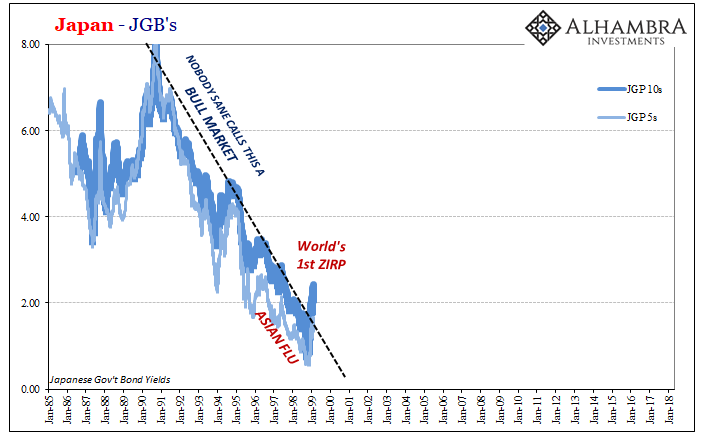 What matters is the level of interest rates for a great many years to come. Therefore, a rise in interest rates only affects the stock market to the extent that it affects the general perception of where interest rates will be over the next decade or longer. To further explain, the value of a company is the sum of the present values of all its future cash flows, with the present value of each future cash flow determined via the application of a discount rate (interest rate). Nobody knows what these cash flows will be or what the appropriate discount rate should be, but guesses, also known as forecasts, are made. Clearly, when discounting a set of cash flows spanning, say, the next 30 years, it won’t make sense to simply use the current interest rate. 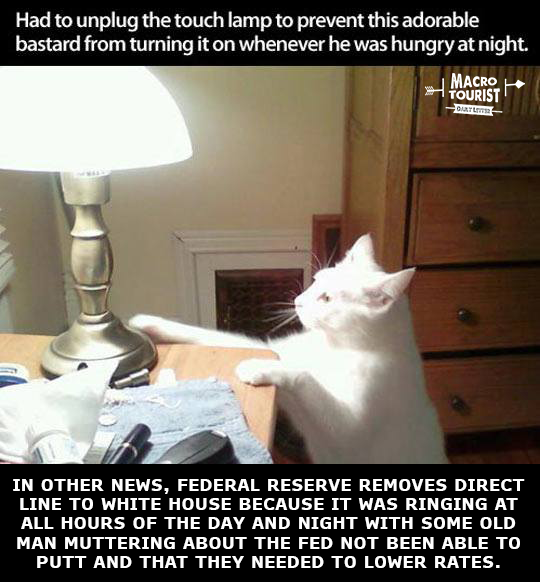 Instead, the analyst doing the calculation will have to make a stab at what will happen to interest rates in the future. (Bloomberg) — The bond market is losing confidence in the Federal Reserve’s policy tightening projections after a punishing stretch for U.S. stocks. Traders pared wagers on 2019 rate hikes last week as disappointing corporate earnings helped drag the S&P 500 Index down 10 percent from its record high at one point Friday. Markets are now factoring in fewer than two quarter-point hikes for next year, compared with the three increases that policy makers project. Tanking inflation expectations suggest some investors already deem Fed policy too restrictive. Meanwhile, back on the equity farm, S&P500 valuation is near the “cheapest” since 2016. Don’t you love it how, now – after the biggest sell-off in fixed income in decades – suddenly everyone is bearish? Long-time readers will know how I am a Kodiak Brown when it comes to fixed-income, but even I can’t bring myself to sell into this hole. 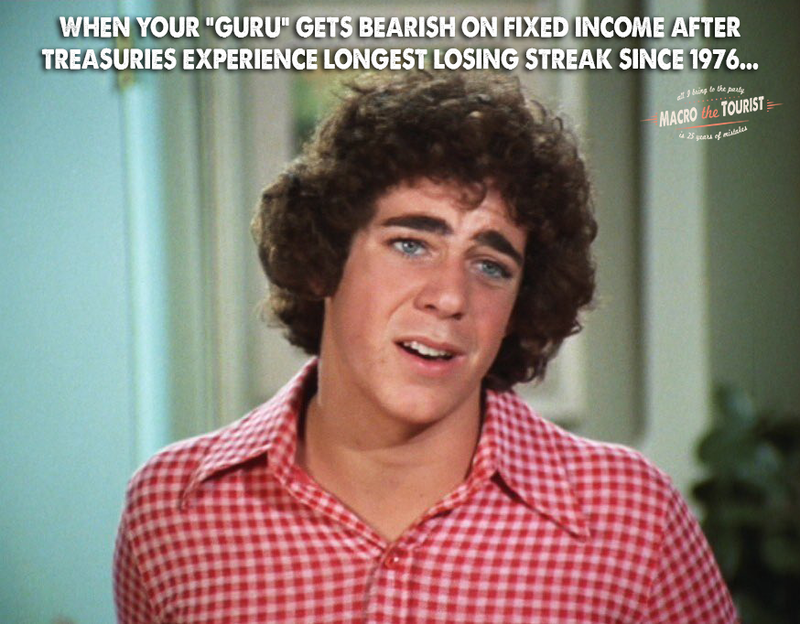 I mean, c’mon – do you really think that waiting for your guru to announce on CNBC that two closes above 3.25% for the 30-year bond constitutes a trading strategy? 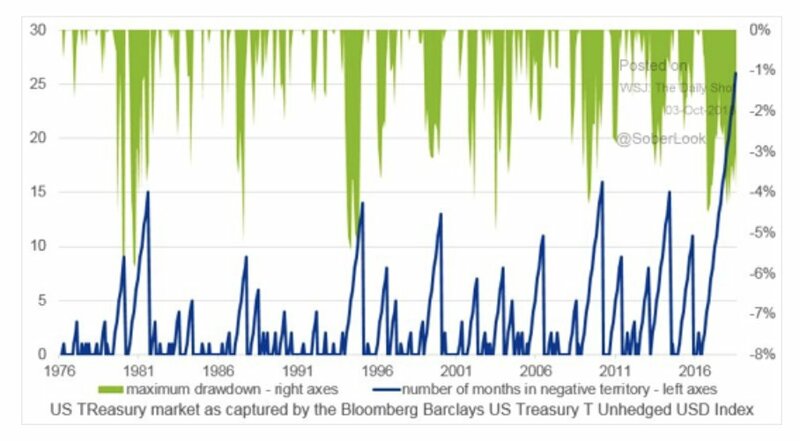 3 Quickfire charts on US bond market sentiment… some of these sentiment charts are clearly at an extreme – and that’s usually when you go looking for contrarian signals. But then I look at a lot of charts on the bond market and it’s quite easy to make a case for a major trend change. 1. Speculative futures positioning: The standout here is speculative futures positioning in the 30 year… gone from around neutral to extreme short. Total capitulation. Following on from yesterday’s post on Cross Asset Volatility, the chart of today is a focus on bond volatility. Specifically what we’ve got here is a look at the rolling annual sum of daily changes in the US 10 year treasury bond yield which exceeded varying hurdles (the smallest hurdle being 5 basis points). What the chart shows is a collapse in bond volatility. What’s interesting about this is that the smallest hurdle indicator is starting to turn up, and typically when these types of indicators turn up from such low levels it can mark a major turning point. The issue is that a rise in volatility can come in a falling yield environment as well as a rising yield environment. As I was updating my various charts and models, something weird caught my eye. 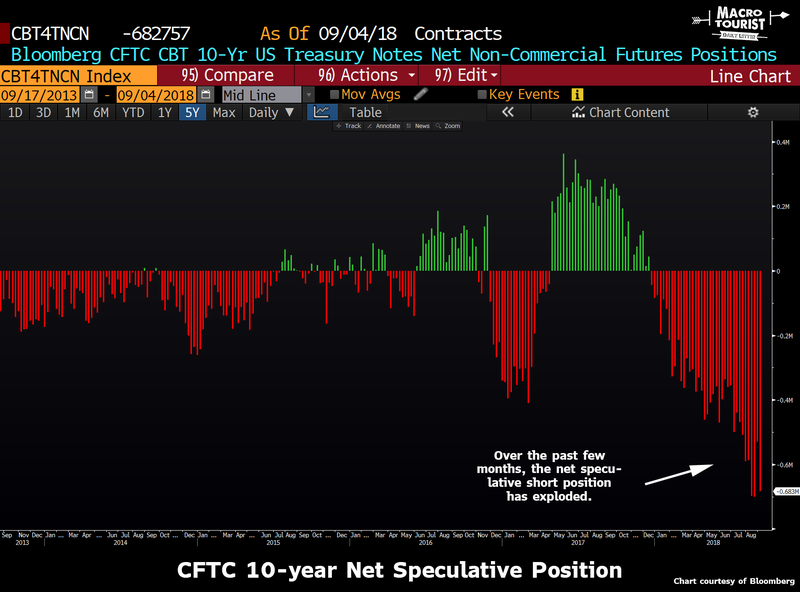 This peculiar chart shows speculative futures positioning in equities (aggregated across all US index futures) and bonds (US 10 year treasury futures)… and most notably, the spread between them. With bond traders the most crowded short in recent history, the spread between bonds vs equities positioning is at an extreme. So what? Let’s break it down: if traders are short bonds they expect yields to rise (which usually happens as a result of higher growth and inflation outcomes), and if traders are long equities they expect stocks to go up (which similarly hangs on a supportive growth backdrop). So basically what we’ve got here is traders doubling down on a view that growth and inflation heats up even further from here. They may be right. 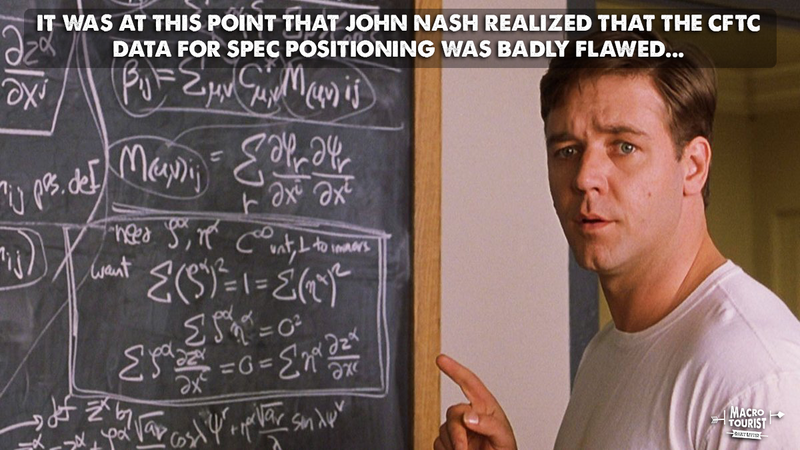 But if they’re wrong, there will be a lot of scrambling to cover positions (aka the long awaited return of market volatility). So if you’re looking for latent pressure building up in the markets, you’ve found it in this chart. I actually like it when we get past June 20. Knowing that each day has less sun is like a gift to me. I can’t say why. It just feels like a sense of relief. Let’s look at some ETFs together. It would make a better narrative for me to order these differently, but I’m going to be lazy and leave them alphabetical. First is commodities, which I think will roll over beneath the red horizontal I’ve drawn. Crude oil, in particular, I believe will drag this lower. The diamonds remain in a long-term and intermediate-term uptrend. Short-term, it’s starting to gently turn lower, but as you can see from the moving averages, it’s going to take a LOT of damage to break this bull run.